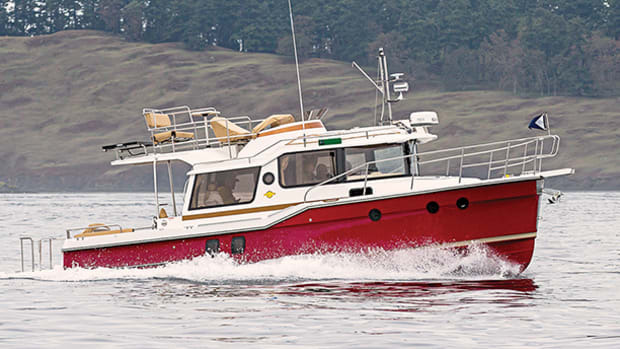 With single-diesel efficiency, state-of-the-art construction, and nifty features galore, the traditional-looking Ranger R-31 is a very modern cruiser. I used to work on one of the prettiest oceangoing tugs in the world—at least that was my take on the M/V Sara Hayes back in the day. The Hayes had a black hull with a monster bow, a towering buff superstructure, red-lead-hued decks, and a sheerline that was a piece of pure seafaring poetry. She was an ancient specimen, too—no question. But we mostly kept her lookin’ like a yacht and, as if to proudly compensate for her old-fashioned appearance, she carried more modern paraphernalia onboard than tugs half her age, including the very latest in marine electronics. 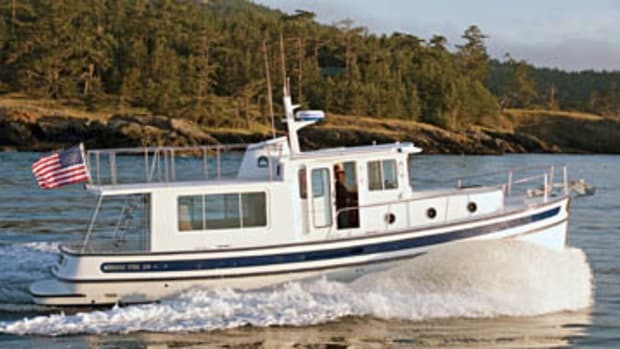 The Hayes came to mind when I boarded the new Ranger Tugs R-31 at a lovely, evergreen-fringed spot in the San Juan Islands, up in the Pacific Northwest, last summer. The 31’s got a pretty profile, a traditional color scheme, and a design heritage that obviously goes way back, perhaps even to the beginning of the 20th century. But trust me—I soon saw lots of ways this trailerable (trailerable!) 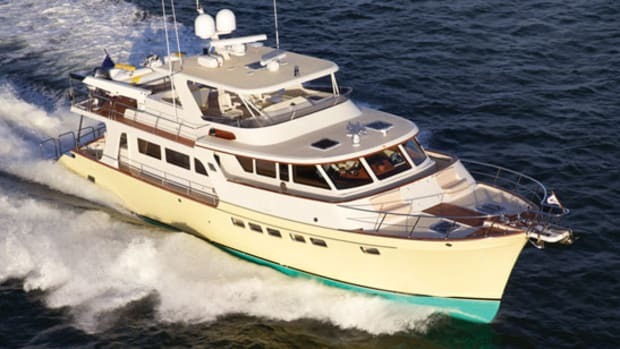 31-foot flybridge cruiser puts a thoroughly modern spin on things. Take construction. To engender strength, durability, and rigidity, the 31’s got a solid-glass, one-piece, closed-cell-foam-filled stringer grid that reinforces her solid-glass hull. And the grid is not merely tabbed in place or bonded with plain ol’ polyester putty—it’s secured with a high-end, high-viscosity ISO-NPG product from Dura Technologies that forms a super-stout, nearly indestructible chemical bond. 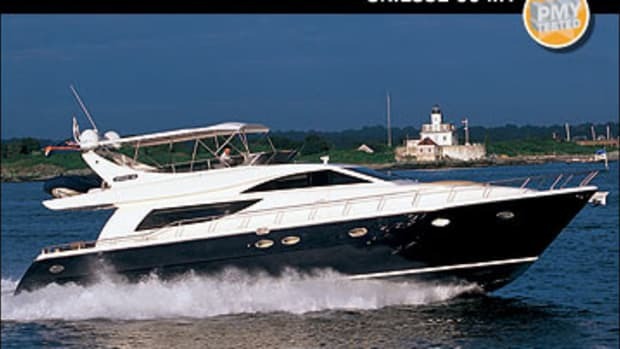 Moreover, the deck/superstructure is stiffened with Nidacore and Coremat and solidly mated to the hull with mechanical fasteners as well as resilient Bostic 1100 urethane adhesive. Two liners (one in the forward cabin area and the other stretching aft into the cockpit) complete the robust, unitized, up-to-the-minute scenario. 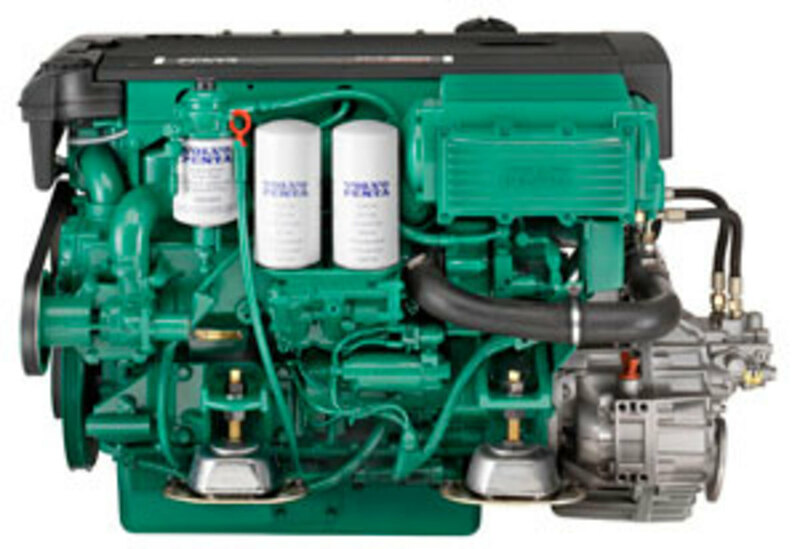 The Volvo Penta 300-mhp diesel inboard is a common-rail fuel-injected engine with dual overhead cams, an aftercooler, and a turbo. 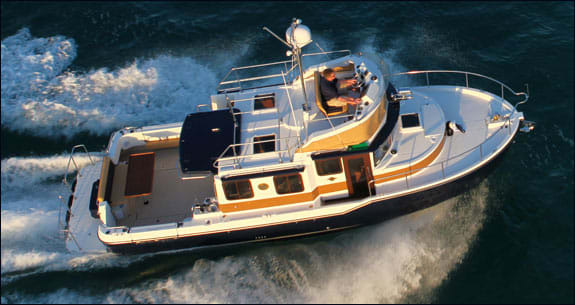 Then there’s the one-and-only powerplant—a single, 300-horsepower Volvo Penta D4 diesel inboard. For starters, the engine itself is wholly contemporary, with a common-rail fuel-injection system, Electronic Vessel Control (a CAN-bus-based electronic platform that proffers digital throttle and shift as well as a dash-mounted digital display with a raft of parameters), and a roster of comparatively friendly emission levels. Because it’s so closely matched to the naval architecture of the 31’s semi-displacement hull form, the D4 produces some highly efficient slow-mo speeds (which are increasingly in vogue these days) as well as higher, gotta-get-there-in-a-hurry velocities. As luck would have it, I had the opportunity to score the 31 on both counts on a particularly cool, misty morning with nary a ripple in sight. 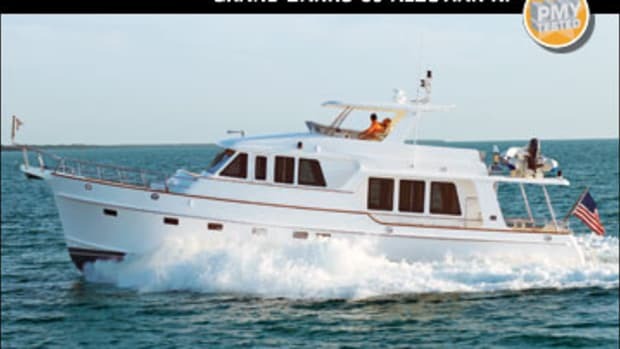 Right off the mark, the muscularity of the boat’s gutsy unibody construction announced itself, thanks to the cabin sole’s solidity underfoot, the absence of creaks and groans while I did a few wake-hopping exercises, and the thunk I heard every time somebody closed the Diamond Sea-Glaze door in the after bulkhead. The average top hop of 18.7 knots I recorded was brisk enough to deal with emergencies, but the real charmer was the boat’s low-end efficiency. Making 7.5 knots while burning a little more than 4 gallons per hour is most assuredly sweet these days. Open-water handling was spirited. Hard-over, full-throttle turning circles were tight (I figured the diameter of most of ’em was about two boat lengths) with a slight outboard lean, which is not atypical of a vessel with a significant keel, a power-nozzling tunnel, and a single, grounding-shoe-protected prop. Running attitudes (topping out at 4.5 degrees) were optimum. And while the boat tipped forward slightly (about half of a degree) at idle, most likely due to a bit of prop-generated lift at the stern, I noted no tendency to bow-steer at any rpm. Tracking was straightforward (no doubt in part due to the aforementioned keel), sightlines from both upper and lower helm stations were excellent, sound levels were very civilized at the lower helm, and the U-Flex hydraulic steering was buttery smooth. Ease of operation dockside? 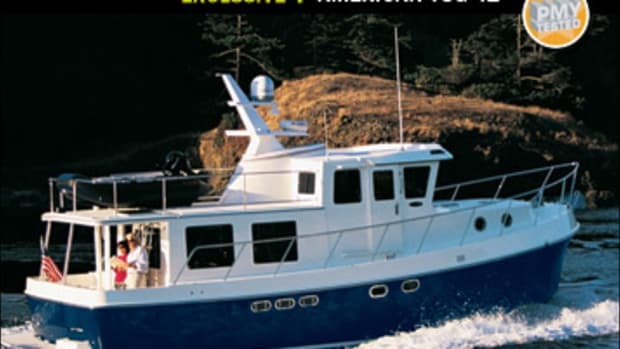 At the end of the sea trial I got to park our 31 alongside another brand-new Ranger and lemme tell ya—idling into the little cove and then simply sidling sideways was, as my French Canadian relatives used to say, a piece de gateau. 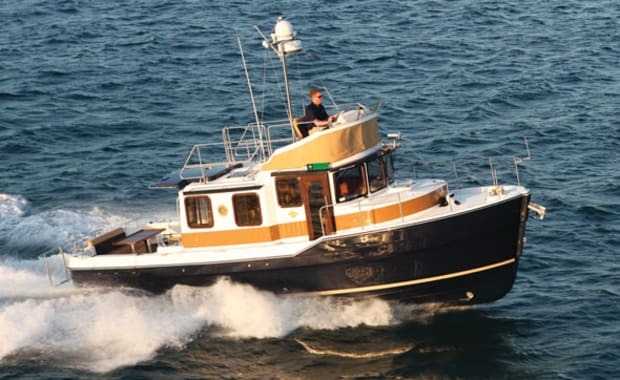 Split-second-actuating electronic engine controls, bow and stern thrusters from Side-Power (standard issue on every 31), and a big, four-bladed wheel with lots of torquey diesel power—the whole shebang made the process as effortless as it was fun. The tour I did afterwards was equally pleasing. 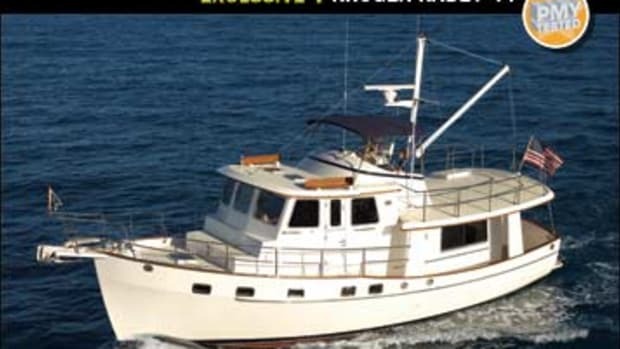 As emphasized earlier, the 31 is a trailerable cruiser in spite of the fact that’s she’s got two staterooms (an amidships cabin with dayhead and a master forward with island berth and en suite head), a saloon (with convertible dinette, smartly accoutered galley, and helm station), and, would you believe, a flying bridge that folds down on hinges to reduce trailerable air draft to 13 feet 2 inches. Folds down? Yup, you simply unhook the custom-cut canvas that doubles as a cowling, drop a couple of inner supports, and let the thing settle flat. I could see the arrangement coming in handy while rollin’ down our nation’s highways for sure. Or hey, even while purring down our nation’s inland waterways. Other nifty features revealed themselves as I continued my tour, among them: “gull-wing-type” seats in the cockpit inwales that cantilever outboard, thereby matching the cockpit’s roominess to its sociability factor; a starboard-side pilothouse door that facilitates single-handed tie-ups; stair-tread access to the flying bridge instead of a ladder; a rather slow, hydraulically actuated engine-room hatch in the cockpit that can be lifted more speedily by hand in emergencies; and a veritable array of folding, sliding, and rotating wooden surfaces in the interior, particularly in the galley area, that boost food-prep space when necessary. All this cleverness was cool, of course, but it also generated my one and only complaint: While there are many innovative details incorporated into the 31’s overall design, traditionalists like myself may be put off by a few of the incompatibilities that seemingly arise. Plastic name boards (red to port, green to starboard) are a good example of what I’m getting at here, and another is the use of bronze portlights in the superstructure, despite the fact that the rest of the exterior hardware is stainless steel. Is any of this stuff a deal-breaker? 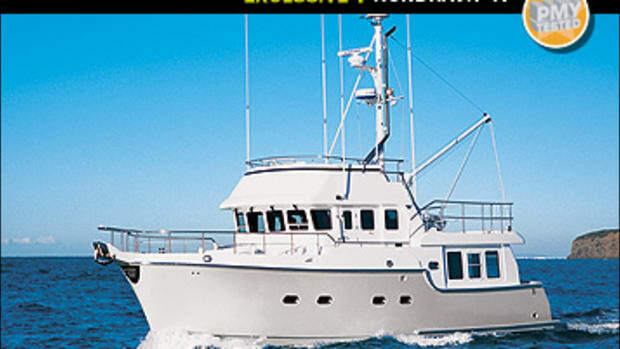 Hardly—Ranger’s R-31 is a progressively constructed, seriously economical long-range cruiser, with a plethora of cruise-worthy features onboard. Yeah, she may look like an old-fashioned tug at first blush, but as with my old favorite the Sara Hayes, she’s simply and delightfully not. 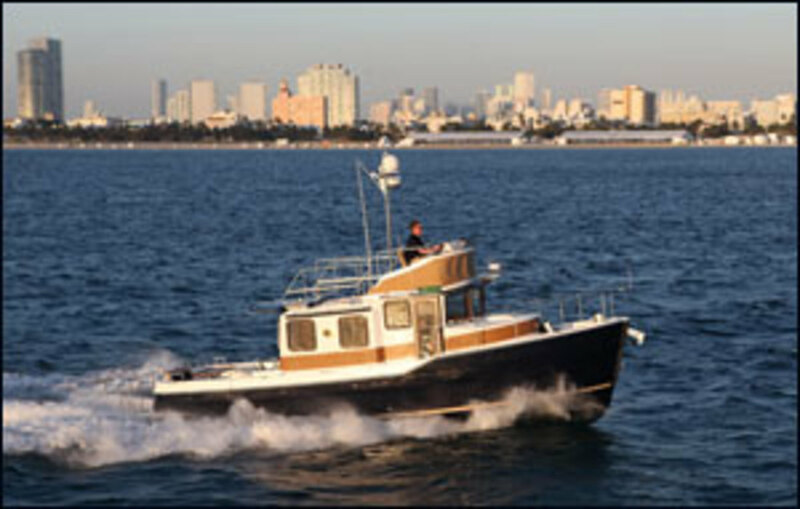 Click to see listings of Ranger Tugs currently for sale on BoatQuest.com. 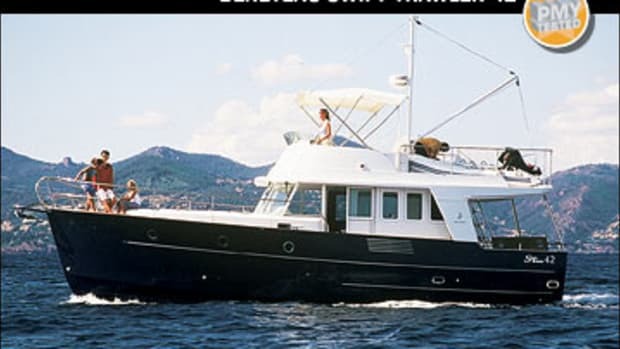 NOTEWORTHY OPTIONS: Navigation package w/ Garmin GPSMAP 5215 at lower helm and GPSMAP 5212 at upper helm ($13,997); Garmin GHC 10 autopilot ($5,999); 5-kW Onan genset ($13,300); 28,000-Btu Cruisair A/C system ($7,650); Kyocera solar panel ($2,000); Webasto diesel furnace ($5,450); Side-Power wireless remote for thrusters ($759). 170 gal. fuel, 70 gal. water; 4 persons, 1,000 lb. gear.